school in the same year. from the same high school. season and has not happened since in the state of Kentucky. To quote retired Henderson Gleaner-Journal Editor Ron Jenkins: 1955 through 1959 were Henderson City High School's "GLORY DAYS". And they had their "Glory Days" like no Henderson team before or after this remarkable school year of 1955-56. Very few high schools in the our great country could even come close to that unforgetable 1955-56 year for these Henderson City High School student/athletes. Not just one team went to the Kentucky state tournaments, all 4 major sports went and performed well. Without a doubt, this is one of the finest years in high school sports history for this extremely talented Henderson City High School. To top that off, Henderson also produced one of the greatest high school athletes in Kentucky high school history, Pascal Benson. Track & Field: 4th place in KHSAA Track Meet Finals. Henderson City's 5' 6" Bill Ruff is KHSAA Track & Field pole vault champion in back to back state meets in 1956 & 1957. Pascal Benson named 1st team all-state in basketball, football and baseball, a feat that has not been matched, before or after the 1956 season in the state of Kentucky or any other state. Unlike Bruce Springsteen's #1 hit "Glory Days", these Henderson players don't brag about what they accomplished. The Henderson City High alumni & fans own the bragging rights. High School on outer 2nd St.
closed their doors after 64 years, 1947-2011. 1. Henderson City High football team goes undefeated in 1955.
state football champions for the 1955 football season. by the Litkenhaus rating system. Kentucky State Track meet in 1956. 4. Henderson City High's Pascal Benson becomes first Kentucky schoolboy player in history to be named to first team all-state in 3 different sports, all in the same year. NOTE: Henderson's Pascal Benson was named to 3 all-state teams in the same year is possibly the only player (there probably are a few in other states) in U. S. High Schools to achieve this feat. After researching the internet for 3 years, looking for some other high school players that may have accomplished this, and I found no other players that have also been named to 3 all-state squads in the same year. Pascal also holds the distinction of throwing a rare perfect game in his junior year for the 1955 Barret Manual High baseball team. in State basketball tournament in 1955.
final poll of year by the *Litkenhaus ratings. 7. Henderson City High finishes with undefeated regular season in 1956 baseball. 8. Henderson City High Flash finishes 3rd in state baseball tournament in 1956. 1953 through 1957, in 4 different sports. Sonny Watkins, '54 football, '55 football. high school has accomplished that feat in Kentucky. baseball in regular season in 1959. 12. Henderson City High football team finishes Undefeated in 1959.
football players in 1959, Tommy Glover, Jim Biggs, John Wheeler and Delbert Estes. previously unbeaten & the top ranked Ft. Thomas Highlands 12-7.
local history for all Henderson Schools in basketball. 16. Henderson City High's 1955 undefeated (10-0) football team is the second team in local high school history to finish a sports season with an unscathed season. 17. The undefeated 1959 Henderson City High Flash football team becomes the third sports team from Henderson to go undefeated. the 1959 Flash football state champions (KHSAA) finished the season with an unblemished 12-0 mark. 18. 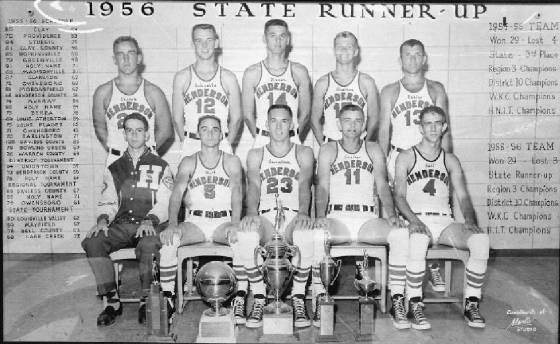 The Henderson City High School Flash repeated with another undefeated season again in 1959 as they finished flawless, with a 12-0 season.This was concluding the KHSAA state championship with a victory over the previously undefeated and the top ranked Ft. Thomas Highlands High School. 19. Tommy Glover is named 1st team high School All-American as a fullback. Tommy is also named the National High School player of the year for 1959. Glover was named to the 1st team high School All-American squad as a junior in 1958. Glover is also the only football player in Kentucky High School history to play on 2 state championship and 2 teams undefeated football teams, doing this in a 5 year span. He accomplished this as a reserve eight-grader and as a starting senior. The school year of 1955-56 is the only year that a Henderson City team defeated the Owensboro Senior High Red Devils in all 4 major sports consisting of football, baseball, basketball & track/field. This year's football victory was a rare road win at Owensboro's Rash Stadium. 21. Coach Don Shelton becomes the first coach in Kentucky high school football history to coach 2 undefeated teams. He accomplihed this in 1955 and repeated it again in 1959. 22. Henderson City High's Tommy Glover was named the 1959 KHSAA player of the year & the National High School football player of the year . Tommy attended the University of Alabama, under the guidance of the legendry Paul "Bear" Bryant. Through the calendar year of 2009, Tommy is still the only athlete in Henderson history to be named to a high school All-American team in any sport. 23. The 1916 Barret basketball team finished 12-0 and were the unofficial first Kentucky state basketball champions and went to become the National High School champs by defeating Parkersburg, West Virginia. 24. David Eakins named to the all-regional basketball team as a freshman. 25. The 1954-1955 Barret High School Purple Flash is only one of two boys High School team in Kentucky High School history to ever achieve a 100 point victory margin. Oddly enough, both 100 point margin games were in the 1954-1955 season. The 4th ranked Purple Flash defeated the Uniontown St. Agnes Knights in 10th district tournament play, 118-18 on Feb. 21, 1955 at the Henderson Holy Name High School gymnasium. The Barret Purple Flash were led by three 2 time all-state performers, Center Don Gish, Forward Byron Pinson, with super sophomore guard (future 2 time all-state performer) Dave Eakins, forward (future all-state performer) Pascal Benson, and all-Region guard Billy Brown. Coach T. L. Plain pulled all five starters out of the game early in the 2nd quarter. Leading scorer for the Henderson Barret Purple Flash was 5'6" sophomore reserve guard Bill Ruff, who burned the nets for 38 points in 22 minutes of playing time. Barret center Don Gish was all-state in the 1953-54 season and repeated again in the 1954-55 season. Byron Pinson, Dave Eakins & Pascal Benson were all-state performers in the 1955-56 season with Dave Eakins repeating again in the 1956-57 season. To say the Uniontown St. Agnes Knights were outclassed is an understatement. This is the same St. Agnes squad that allowed Wayne Oakley of Hanson High School to score an all-time Kentucky High School state record of 114 points. All three of these records set in that 1954-55 season still stand today. rating system first appeared in the 1953 season.